All is not well in the world of Warhammer 40k. Things have been pretty bad ever since Horus slew the Emperor, but things are particularly bad right now. The launch of Warhammer 40K: 8th Edition also signaled the beginning of a period of time known as the Dark Imperium. The galaxy has been rent in half, cutting huge swaths of humanity off from Terra and the light of the Emperor. Of course, there are still Xenos, Demons, and the omnipresent burden of grimdark bureaucracy to contend with as well. This Dark Imperium is the world in which the upcoming Warhammer 40K RPG Wrath & Glory is set. If that doesn’t sound appealing, there is something else you should know. Despite all that darkness, all those aliens, and all those offices of the Administratum that I can barely remember there is also one thing: Hope. I’ve been devouring 40K lore via Black Library books faster than I can play the game, and the one thing present in every story and in every character is hope and belief in the strength of an individual’s spirit. Wrath & Glory will let you experience that as well. We’re excited about this upcoming title and I spoke with some of the design team to get more information. “I see the sense of hope in the characters as core to what makes someone exceptional in the Imperium – that’s what makes them a character and not a downtrodden NPC.” says Wendelyn Reischl. These characters all have values and beliefs they cling to in the face of conflict, and it’s these values that inspire them to go out into the dark universe. You’ll have to rely on your friends, those around the table and in the game, to find success. To do that, you’ll first have to decide the Power Tier in which you’d like to set your game of Wrath & Glory. The lore of Warhammer 40k is rich and deep; it tells the stories of individual normal humans along with those of superhuman Space Marines. It can be a little daunting and one of my concerns was approachability for people who aren’t well versed in the lore of 40k. Both Wendelyn and Andrea Gausman – another member of the team – pointed me towards the Power Tiers. There are 5 Power Tiers in Wrath & Glory. The lowest, Tier 1, is an appropriate place to dip your toes into the lore if you’re unfamiliar. In Tier 1 “…the characters are also a little naive about the Imperium” wrote Wendelyn. This lets you and your character grow together. Your characters will be individual Imperial Guardsmen, Eldar Corsairs, and Ork Boyz. These are low-power entities of the 40k Universe, much like you and I. “The sense of being a ‘mere mortal’ struggling against impossible odds in this epic universe is very strong at the lowest tier of play.” wrote Andrea. At higher Tiers you’ll step into some of the more iconic figures of the 40k world. According to the (excellent) designer diaries the team is posting, the iconic tactical Space Marine is a Tier 3 character, with their stronger Primaris brothers playing in Tier 4. These more powerful entities will crush the enemies of your Tier 1 guardsmen, but of course they’ll have much tougher challenges to face themselves. Of course, there will be ways to bring your Tier 1 characters forward or play with those archetypes in a higher tier. It isn’t just player options that change. Wrath & Glory resolves conflict through a pooled d6 system. According to the design diary, these pools shrink and grow across Tier levels. This provides an escalation of difficulty but also a very real tactile response to the rising stakes. Luckily, this RPG has adopted a ‘fail forward’ style resolution. Failures wont’ bring the game to a crashing halt, but instead introduce complications and difficulties for the heroes to grapple with. You can follow along with the action in this great webcomic. Wrath & Glory will release later this year, and we’re excited to return to roleplaying in the 40k universe. 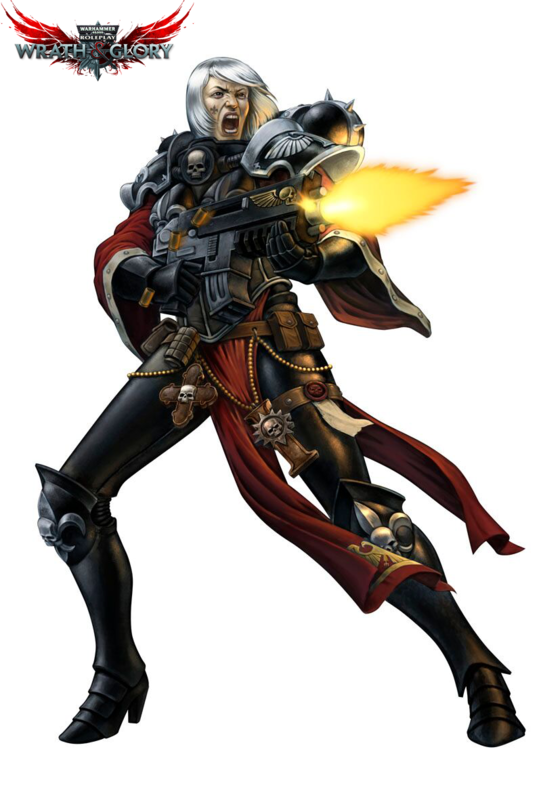 I’ve loved the lore of the Adeptus Sororitas since I started this journey into 40k and can’t wait to don the power armor and burn the heretic! What would you want to play as in the universe of Warhammer 40K? Tell us in the comments. And don’t forget to tune in on Twitch and Alpha for fantastic RPG shows! Want to learn more about the grim dark future of Warhammer 40K? Learn about Raf’s journey into becoming a Warhammer 40K player. Learn about the most awesome women in the 40K universe. Dive into 40k’s mythology with mythology vlogger, Dael Kingsmill.